Autumn is around a long corner in the central valley, and all the autumn leaves have been on my mind. Did you ever try catching the colorful autumn tree leaves before they fell to the ground on a breezy day? Growing up, I had so much fun playing outside with the leaves. On the internet I’ve been catching up with some great leaves as I’ve had a chance to look around a little more in the past week or so. Here are a few posts where I caught a glimpse of some wonderful leaves. Thank you ladies for sharing your work! Regular readers may remember a few of my previous posts on the subject of leaves. Leaves have always fascinated me. And when my friend Anne Gailhbaud started talking to me about her leaf sampler early this year I was excited. And then she sent me a sampler of leaves that is beautiful, each leaf is worked in a different type of stitch. If you haven’t checked Anne’s website lately please do. It’s updated with lots of new work from this year. a tree, open chain trunk over the long tie downs of the branch chains and a few detached chains at the top with a few straight stitches at the bottom. I’ve had a lot fun with this stitch. There are a few more trials I want to try with it. And I want to do some research on one of the variations. But I don’t think it will be this week. Next post Wednesday (us, west coast). The concept of change that Sharon b picked for April’s TIF is a huge subject to think about. The one thing that flew into my mind immediately are the changes promised by the eternal God in the Bible. There are so many of these changes that are the joy of my heart and fill me with anticipation. However, since I could only illustrate a few at best and I’m trying diligently to simplify all my TIF concepts to be stitchable in a month; the challenge was on. The heart seemed like a perfect shape to illustrate two promises I decide to focus in on. They are in Isaiah 1:18 and Ezekiel 36:26. The first the change of our sinfulness from red like scarlet and crimson to white like snow and wool. And the second a change of heart from like stone to one like flesh. I went out trying to take photos of red leaves. I got rather carried away with the project. Instead of capturing a variety of leaves, I tried to capture the movement of the unfolding leaf–from brand new to the clipped hedge. I wish I’d thought about this earlier in the spring so many of the leaves are already loosing the red color. I’ve just found that a raised buttonhole stitch helps in creating the illusion of a crenate, serrate or dentate leaf edge. I found it much easier to deal with than the buttonhole stitch itself. For more on leaf edges or margins please see this post for links. This is a stitched sample in lavender blue. but there were a few trials and errors along the way. Here is another stitched leaf using the Van Dyke stitch. Many thanks to Photoshop Elements for their filters and to Classic Stitches and Arts and Designs for their stitch glossaries. And many more thanks to my friend, Anne Gailhbaud, whose leaf sampler has been so inspiring to me this year. If you haven’t seen some of Anne’s work by clicking on my blog categories or by visiting her website please do take a moment to do so. She does so many things creatively with beads, threads and fabric. What color are the leaves in your world? It must have taken a hundred strawberries or more to fill a cup. We worked in a hurry and some of the strawberry leaves were red. Perhaps they lacked or gained some particular nutrient from the soil. But every once in a while in our hurry, when we reached for a strawberry all we got was a little red leaf. No, it wasn’t this red. But I’m going to put it in an envelop and send it off to my sister. I’m still working on leaves every day. In my world of needles and threads even lavender and blue leaves may fit in. I’ve been doing my best to learn the woven picot stitch Ann showed me. Also I experimented on making leaf shapes with it. Some of my attempts are bad. This first photograph hides nothing. I might have started out ok but the closer I got to the end the more mistakes I made. This is an attempt at an oblanceolate leaf. Here I was able to turn out one or two acceptably but nothing was consistent. These are my attempts at ovate leaves. I think this tree growing close to me has beautifully shaped leaves. My attempt at trying to make it was very unsuccessful. I took 3 needles radiating from one point and seven strands of thread to weave. Much more practice is called for! The third embroidered leaf from above I show again very enlarged so perhaps you can see what I try to explain below. I used one loop like a normal woven picot. Then I made a second smaller loop before taking the thread to the tip of the leaf to start the weaving process. I did the first rows of the weaving with just the one loop and the thread running down to the tip. Then as I approached the mid point, I began to weave in the second loop. I did not pin it as I did the first loop. But it was not difficult to work in and by the second row held in place well. Then at the end I began pulling everything very tight. I’m working with pima cotton which is much more giving than a Perle cotton. And finally I let some of the threads in the loops carry to the back as I closed it off. If anyone has tips or suggestions for me, I would appreciate it. I love leaves. I’ve subjected them to scrutiny since childhood. And now my friend Anne Gailhbaud has sent me a fascinating embroidered leaf sampler. She was making one to detail the various stitches she could use in her embroideries. I was filled with delight about the project but no matter how she scanned it and sent it, I could not see the details and determine the stitches she was using. Finally she did what what very few would do. She made another one and sent it to me. A totally wonderful surprise. 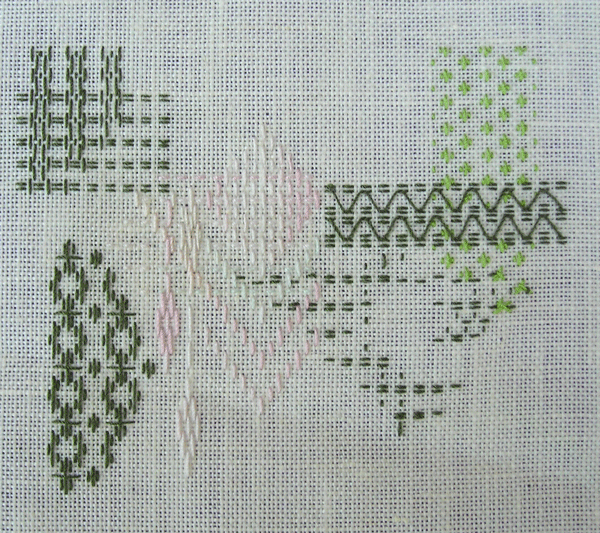 Fifteen leaves in fifteen different stitches. I’m only going to feature one today the woven picot. Using this stitch a leaf may be three dimensional. Here is a good step-by-step video from Mary Corbet on the stitch. Many thanks Mary! I should have watched this before I tried three of them last night on my own. If you share my fascination with leaves, here are some on-line resources about leaves. Shapes the basics — small photograph, English name, Latin name, brief description. Shapes stylized simplified images includes leaf tips, bases and margins. Glossary brief entries with drawings concerning the above and discussing leaf parts, arrangements and placements on stems as well as other structures from the state of Maine. What is a leaf? a short article from Penn State University. Don’t forget to visit Anne’s and Mary’s links if you are not already familiar with them. They are both talented ladies with many things of interest.